The beleaguered island territory wants to borrow $2 bln, implying bondholders still see some value. But job losses are up, people are leaving in droves, balancing the budget without layoffs looks fanciful and debt costs are high. Puerto Rico bonds are not for the faint of heart. Followers of the Popular Democratic Party wave national flags during the party campaign's closing rally in San Juan November 4, 2012. Governor Alejandro Garcia Padilla will present a balanced budget for the year to June 30, 2015, his chief of staff Ingrid Vila Biaggi said on Feb. 3. The government also announced that the projected deficit for the year to June 30, 2015 would be reduced by $170 million to $650 million. Puerto Rico Office of Management and Budget Director Carlos Rivas said there were no plans to lay off government workers to achieve the balanced budget. Puerto Rico has around $70 billion of government debt. Moody’s estimates the ratio of state debt to personal income at 89 percent, compared to 10 percent in Hawaii, the next highest U.S. state. The island lost around 36,000 people or 1 percent of its population between July 2012 and June 2013. The unemployment rate in December 2013 was 15.4 percent and nonfarm employment declined by 2.7 percent in the year to December 2013, according to the Bureau of Labor Statistics. 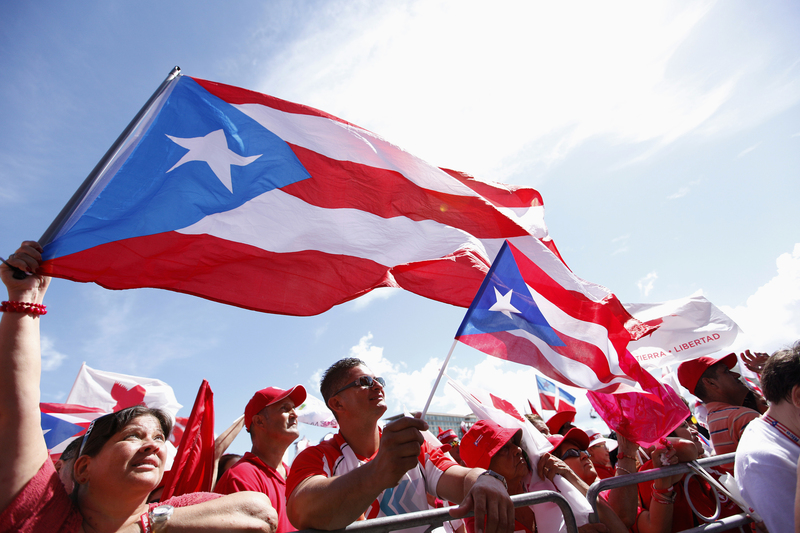 Standard and Poor’s cut Puerto Rico’s credit rating to BB-plus, one level below investment grade, on Feb. 4. The commonwealth is planning to raise as much as $2 billion in the municipal bond market this month.